Do You Know What's Right for Your Pet? One of the key factors contributing to the improved health and longevity of companion animals is our expanded knowledge on the important role that proper nutrition plays in overall health. 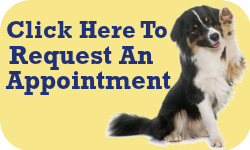 During your pet's comprehensive physical examination, we evaluate his or her body condition and give recommendations based on what we see. However, some pets with nutritional issues or chronic conditions such as diabetes require a little bit more intervention, which may include special foods, feeding strategies and/or prescription diets. We have a large inventory of prescription foods and high-quality nutritional products and supplements. If your pet requires a prescription diet we do not carry, we can easily order it for you.